Home > Market Commentary	> Which S&P 500 Sectors Have the Highest Margins? 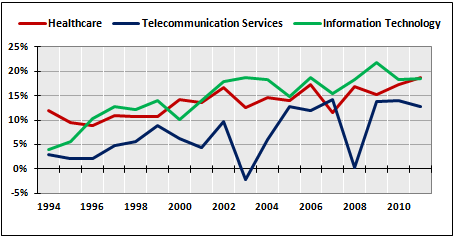 Which S&P 500 Sectors Have the Highest Margins?
. 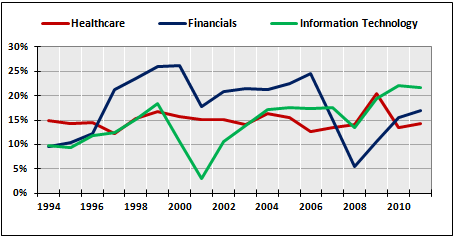 . . if you look at the continued improvement in cash flow margins, that are about 20% today for most companies, still below the 24% peak levels for 2007, I think too many investors are focused on net profit margins, not focused on the statement of cash flows, that’s what can get stock prices higher . . .
Average net margins are also trending upwards, although net margins display pronounced declines during the last two recessions. 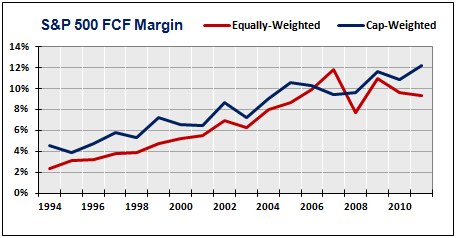 Cap-weighting once again makes a difference, as larger-cap companies earn higher net margins. Further note how the cap-weighted series shows less of a decline during recessions. I also calculated the equally-weighted and cap-weighted unlevered free cash flow margin for the S&P 500, depicted in the graph below. Mr. Sayles definitely gets a few things right. Unlevered free cash flow margins have been in an 18-year uptrend, and the equally-weighted series does indeed peak in 2007. 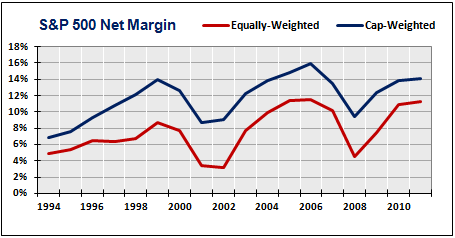 Cap-weighting makes more sense, however, as an equally-weighted series places disproportionate weight on the margins of smaller firms. The graph above shows that the mean cap-weighted free cash flow margin of the S&P 500 is at an 18-year high. 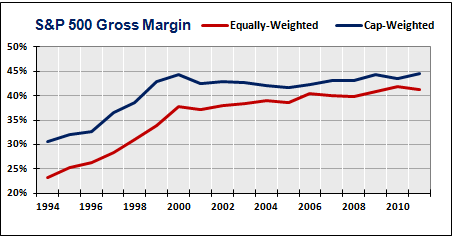 Conclusion: S&P 500 gross, net, and unlevered free cash flow margins trend upwards from 1994-2011. 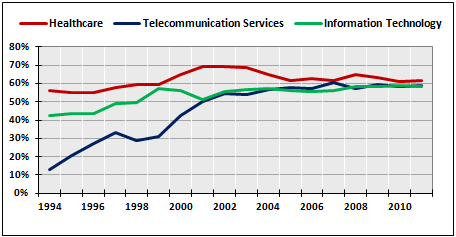 Health Care has the highest gross and unlevered free cash flow margin, followed by Telecom and Information Technology. Surprisingly, Financial stocks’ net margins have rebounded sharply. The mean cap-weighted unlevered free cash flow margin for the S&P 500 is only 12.2%, however, much lower than Mr. Sowerby’s estimate of 20%. One possible explanation for the difference in our findings is that the Loomis Sayles calculations refer to levered free cash flow margin, which we would expect to be higher. I propose that cap-weighted unlevered free cash flow margin is a better measure, however. Levered FCF arbitrarily places more weight on the margins of firms that use more debt, instead of weighting by the more traditional market cap factor. watches, e-ink watches and the binary digital watches. in fact loved account your blog posts. Anyway I will be subscribing to your feeds and even I fulfillment you get right of entry to consistently rapidly.